3 photographs : b&w ; 16 x 20 in. 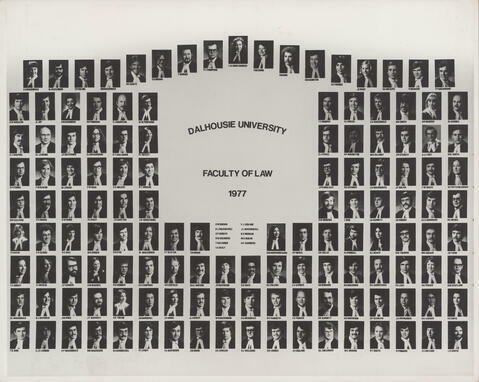 File contains three copies of a photograph of the 1977 graduating class of the Dalhousie University Faculty of Law. The photograph consists of portraits of D. M. Brown; R. J. Dolegiewicz; D. P. Goduto; B. W. Goldberg; T. Haladner; I. A. Healy; V. J. LeBlanc; J. L. MacDougall; B. G. Morgan; M. H. Ogilvie; R. P. Saunders; E. A. MacDonald; B. J. Alexander; C. P. Collins; N. B. MacDonald; R. P. Gaetz; G. O. Brown; T. Hayashi; P. L. Thompson; L. A. Montgomery; F. M. G. Imrie; R. M. Kirk; D. B. Hamilton; S. E. Fremes; J. E. Rush; D. A. Holgate; P. Graham; T. P. Greenwood; K. W. MacLean; J. L. Joy; E. M. Chambers; M. P. Donovan; C. J. Goodyear; W. M. Penfound; A. J. MacPhee; R. L. Jenkins; J. S. Hutchings; S. J. Richardson; D. T. Gallagher; P. L. Rutley; D. P. O'Brien; F. M. Deacon; M. J. Bruni; P. M. Ross; C. S. Walker; N. T. Brogan; M. B. Sullivan; S. R. Enman; D. W. Rubin; K. C. Chaley; J. G. Khattar; J. H. Armstrong; K. Kaleva; E. R. Elvidge; R. C. Hale; M. R. O'Brien; R. D. Eyre; M. MacLennan; F. F. Slatter; S. R. Morse; T. E. Murphy; S. J. Welch; E. A. MacDonald; H. M. Smith; A. R. Manzer; R. L. Barnes; G. J. Stelle; H. F. MacIntyre; W. D. Delaney; J. W. Stanley; A. J. J. Wey; B. W. Smith; J. P. G. Mullally; R. C. Stewart; L. D. MacDougall; J. E. Nolan; T. W. White; S. C. Potts Meadows; A. W. Moreira; L. Reid; J. A. Barrett; J. D. Embree; G. C. S. Morroson; R. G. McNeil; S. M. Hood Robichaud; C. P. Merla; G. R. Sollis; D. J. Kimball; B. J. Beach; D. W. Teheman; M. B. Sherar; J. N. Thom; T. A. Smiley; K. Vihvelin; J. P. Hansen; C. M. MacNeil; R. B. Kennedy; A. S. Karpman; K. R. Costello; M. A. J. Watson; J. R. Matheson; D. G. Ruck; R. E. O'Blenis; L. D. Garber; I. M. Donahoe; B. A. MacAdam; R. A. Carruthers; P. A. Love; S. K. Fraser; D. M. Scotland; D. L. MacDonald; N. J. Bateman; J. M. O'Neil; J. T. Rafferty; A. C. Taylor; J. 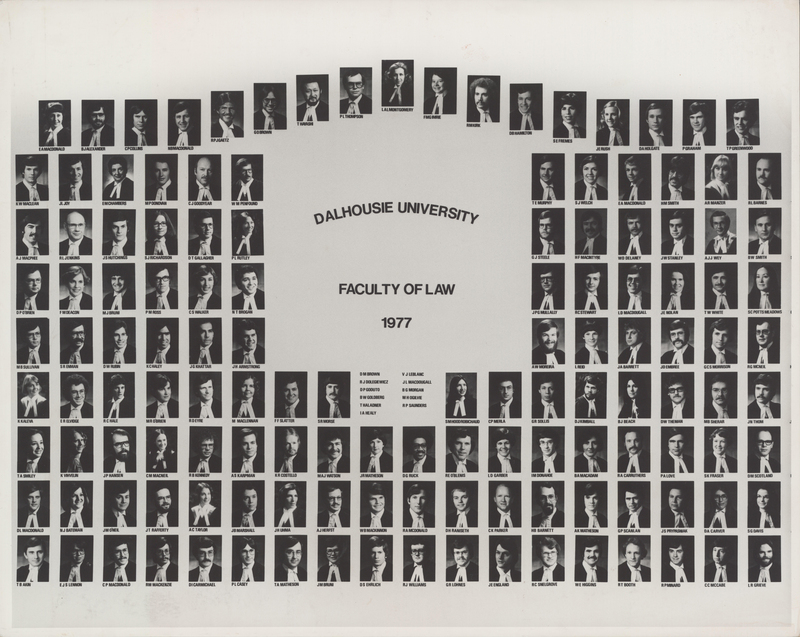 B. Marshall; J. H. Uhma; A. J. Herfst; W. B. MacKinnon; R. A. McDonald; D. H. Raniseth; C. K. Parker; H. B. Barnett; A. K. Matheson; G. P. Scanlan; J. S. Prypasniak; D. A. Carver; S. G. Davis; T. B. Akin; E. J. S. Lennon; C. P. MacDonald; R. M. MacKenzie; D. I. Carmichael; P. L. Casey; T. A. Matheson; J. M. Bruni; D. S. Ehrlich; R. J. Williams; G. R. Lohnes; J. E. England; R. C. Snelgrove; W. E. Higgins; R. T. Booth; R. P. Minard; C. C. McCabe; and L. R. Grieve arranged in nine rows. One copy is warped around the edges and has grey smudges on it.